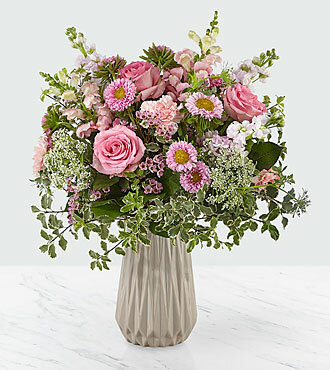 Our Crazy in Love bouquet is a majestic combination of pink hues, adding a remarkable touch to any room. Made up of roses, carnations, asters, stock, snapdragons, Queen Anne's lace, and waxflower, this bouquet is perfect for expressing every kind of love. GOOD bouquet is approx. 20"H x 15"W. BETTER bouquet is approx. 20"H x 16"W. BEST bouquet is approx. 21"H x 18"W.